Selenite is a stone of mental clarity, enhancing mental flexibility and strengthening decisions. With it you can access past lives. It also promotes good business practices and removes energy blocks from the physical and etheric bodies. It aligns the spine, is good for the skeleton, and decreases epilepsy and seizures. Used to clear other stones, place near or beneath. Selenite is associated with the crown chakra. Red Selenite is said to have the same properties as white. 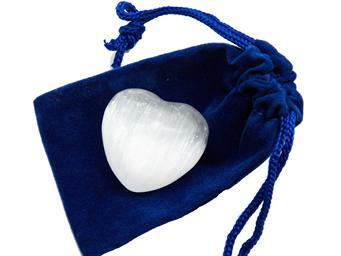 Many people feel the spiritual connections are the same as with white selenite and physical connections are even stronger. Colors of red selenite range from peach to dark burnt orange. Packaged in soft pouch, a perfect gift for yourself or a friend. Warning: Selenite is s delicate stone. Can break when dropped. Not for children. 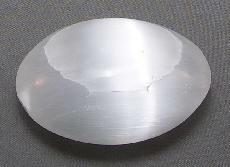 Made of Moroccan white selenite, these wonderful palm stones are translucent, rounded, and smooth on both sides. 2 3/4 x 2 x 1 1/8"
3 1/8 x 2 1/8 x 1 3/8"